The font’s Latin characters are drawn in a fat face ‘modern’ or ‘Didone’ style, similar to letters that were commonly used in 19th-century advertising posters in the West. Rozha One’s Latin characters barely differentiate between upper and lowercase letter sizes; the x-height of its lowercase letters is so high – and the size of its capital letters so small – that these virtually blend into one another in a line of text. Nevertheless, the Devanagari letters are drawn in such a way that they harmonize with the font’s Latin very well in settings where texts in multiple languages sit alongside one another. The headline of the Devanagari base characters is the same thickness as the Latin letters’ serifs. Certain Devanagari letter strokes and vowel marks bare visually similarity to the font’s Latin letters. However, Rozha One does not appear Latinized or un-Devanagari. The font includes 1,095 glyphs, offering full support for the conjuncts and ligatures required by languages written with the Devanagari script. 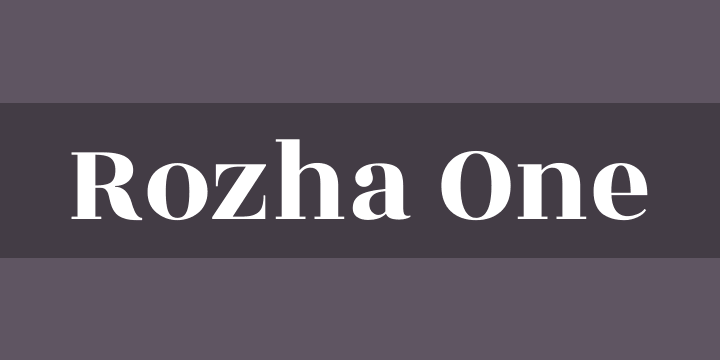 When used in on-screen design environments, Rozha One should be used in very large pixel sizes. However, in print, the design may be used in a broader range of sizes, perhaps even as small as at 16 or 18 points.